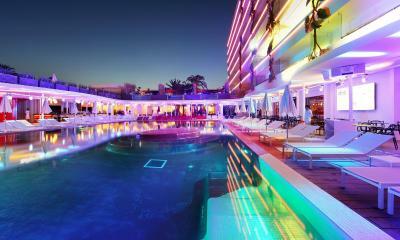 Lock in a great price for Ushuaia Ibiza Beach Hotel - Adults Only – rated 8.3 by recent guests! Guests of Ushuaïa get free access to all the parties in the resort and free access to Hi Ibiza Nightclub which is right across the street from the hotel. Each of which are 60€ so you definitely save money just by being a Ushuaïa Guest. The beach club is phenomenal and the pool was perfect. Also, Ushuaïa is very safe. There is security at every access point checking hotel wristbands plus you need the chip in your wristband to gain access from the beach, so nobody can just stroll in as they want. It was on the beach, enjoyed the music played on the beach and at the hotel. Free access to the on property concert. Fabulous Sunday brunch with great variety and free champagne. Very nice and comfortable rooms, well stocked mini bar, loved the rain bird showers. Nothing. From the second we arrived, the hotel did not live up to the expectations nor the cost. The last day of my trip I got kicked out by somebody from the staff after I had been guaranteed 1 more night and changed plane tickets this guy walks into the room and told me I had to leave the hotel or he would force me since I had no room. Everything about this place was top notch! I wish I could have stayed longer! DJ comes to your hotel, free admission to hi club across the street, staff is very friendly and helpful. This is a party hotel, don't expect to take a nap 5pm-12am. Balcony facing the music arena is awesome! The atmosphere,clean,security and the rooms were pretty good organized and with sound system in it to enjoy the music..with very good isolation between rooms. Ushuaia Ibiza Beach Hotel - Adults Only This rating is a reflection of how the property compares to the industry standard when it comes to price, facilities and services available. It's based on a self-evaluation by the property. Use this rating to help choose your stay! Set on Playa d’en Bossa Beach, the adults-only Ushuaia Ibiza Beach Hotel features a spa and 3 outdoor pools with large sun beds. 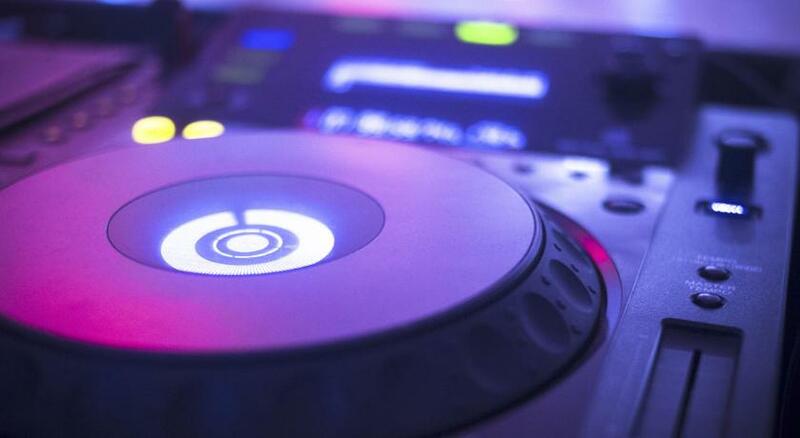 Guests enjoy free entrance to live DJ performances hosted by the hotel. The minimalist rooms are equipped with air conditioning, a 42-inch plasma TV and iPod docking station. They also feature a furnished terrace. 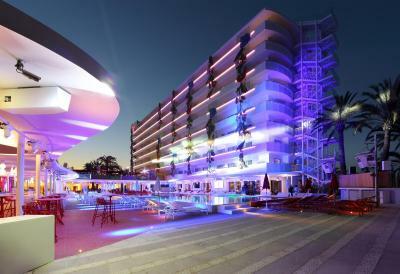 The Ushuaia Ibiza Beach Hotel is made up of 2 separate buildings. 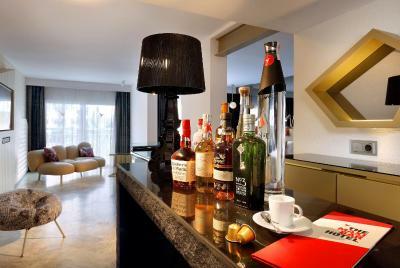 The Ushuaia Club houses the bedrooms and hosts the hotel's famous parties. The exclusive Ushuaia Tower offers 24-hour room service, an outdoor pool, Balinese beds and a poolside cocktail bar. The hotel offers the Minami Japanese fusion restaurant with a Zen garden, as well as a Beach Club restaurant with Mediterranean cuisine. The property's Montauk Steak House restaurant specializes in steaks and other grilled meats. The hotel is 1.2 mi from Ibiza Airport and 1.9 mi from Ibiza Old Town. It is located directly opposite Hi Ibiza. This is our guests' favorite part of Playa d'en Bossa, according to independent reviews. 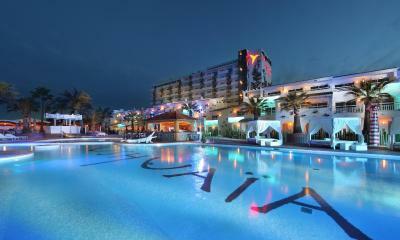 When would you like to stay at Ushuaia Ibiza Beach Hotel - Adults Only? 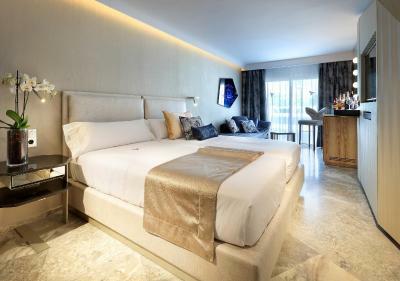 In Ushuaia Ibiza's Club building, this air-conditioned superior room includes a 42-inch satellite TV, free Wi-Fi, a lap-top size safe and blackout curtains. The bathroom includes a dual rain shower and a complete pack of amenities, as well as bathrobes and slippers. 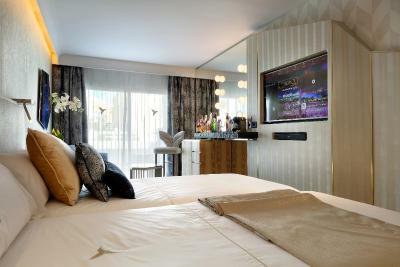 Set in the Ushuaia Ibiza's Tower building, this air-conditioned superior room features a furnished terrace. 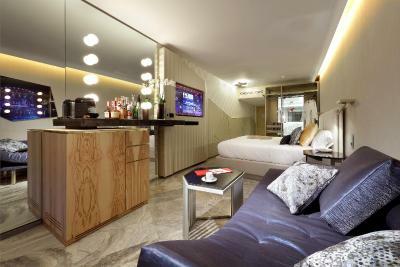 It includes a 42-inch satellite TV, free WiFi, a lap-top sized safe and a mini-bar with premium drinks selection. The bathroom includes a dual rain shower with aromatherapy. These rooms include access to a pool with lounge chairs, set apart from the rest of the complex. 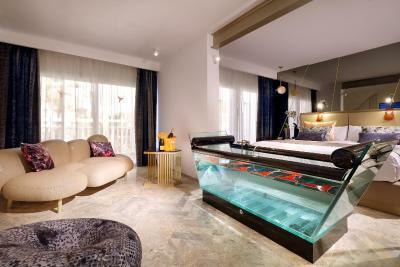 Located in Ushuaia Ibiza's Club building, this suite features a clear glass bath, a furnished terrace and a king size bed. 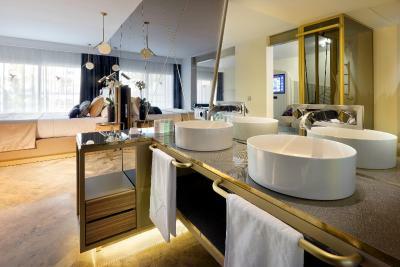 Located in Ushuaia Ibiza's Tower building, this spacious suite offers a terrace with an open-air hot tub. It includes a bar with a range of alcoholic drinks, a 50-inch flat-screen TV, and an iPod docking station. An Xbox 360 and Microsoft Tablet are also provided at no additional cost. 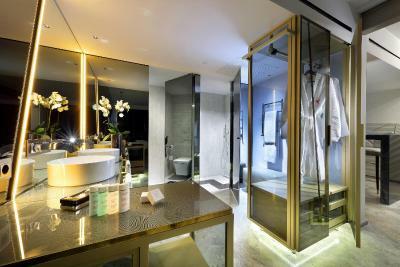 The bathroom includes a dual rain shower with chromotherapy and aromatherapy. 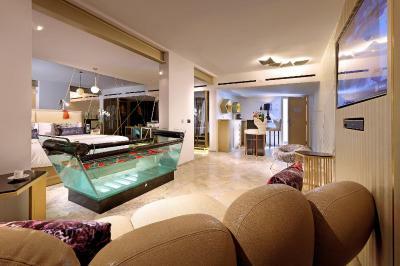 Set in Ushuaia Ibiza's Tower building, this suite offers a terrace with an open-air hot tub and views of the Stage and the Club's swimming pool. It includes a bar with a range of alcoholic drinks, a 50-inch flat-screen TV, and an iPod docking station. An Xbox 360 and Microsoft Tablet are also provided at no additional cost. The bathroom includes a dual rain shower with aromatherapy. 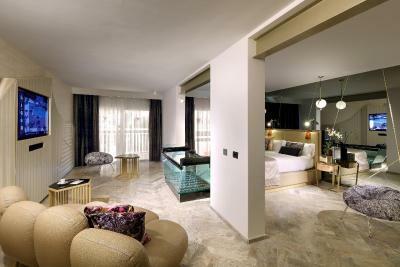 Located in Ushuaia Ibiza's Tower building, this room features modern décor. It features a circular bed, ceiling mirrors, a shower in the middle of the room and a large terrace with a hot tub and frontal sea views. 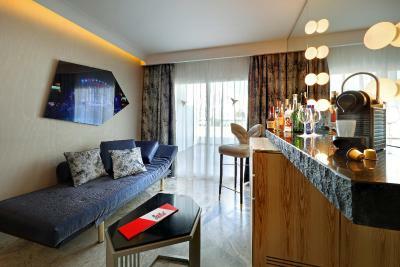 Located in Ushuaia Ibiza's Club building, this twin/double room has air conditioning, satellite TV and bathrobe. These rooms are located on the ground floor overlooking the pool area. 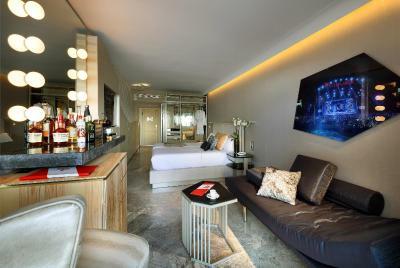 Located in Ushuaia Ibiza's Club building, this twin/double room features a bathrobe, air conditioning and mini-bar. These rooms are located on the upper floors overlooking the pool area. House Rules Ushuaia Ibiza Beach Hotel - Adults Only takes special requests – add in the next step! 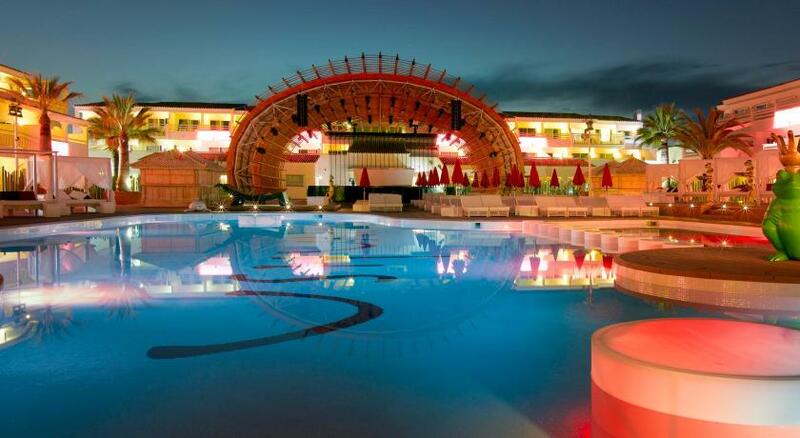 Ushuaia Ibiza Beach Hotel - Adults Only accepts these cards and reserves the right to temporarily hold an amount prior to arrival. Please note that a deposit will be charged upon arrival in order to cover any additional expenses during the stay. 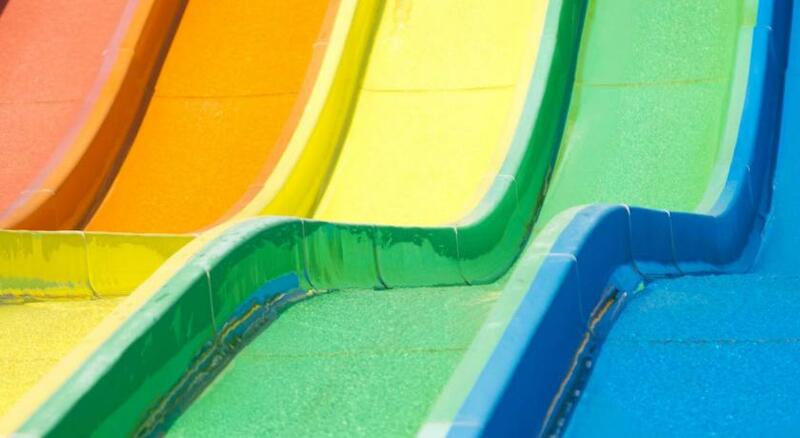 When booking more than 5 nights different policies and additional supplements may apply. We had a anice shock when we were told the hotel needed a £300 deposit which we had no idea about!! Can only point out one tiny detail and that was during checkout when our room was getting checked to see if we would get our deposit back. They had told us we had opened things that we never knew was there which we then thought we were getting charged for. We didn’t in the end but for improvements I would say have more than one person checking the rooms that is all. Small room. air conditioner wasn't strong enough. strict policies regarding alcohol and guests. Location. Right in the middle of the party. Nice room, beach and atmosphere. Ushuaia - always fantastic! Although very expensive. The beds are far too hard and not comfortable. The food offered at the beach for lunch was not suitable for Vegetarians or Vegans.